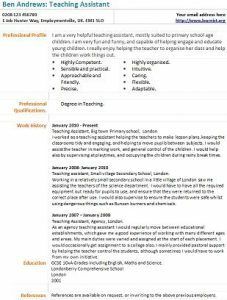 Teaching Assistant CV example and template. Amend as suitable and create your own CV in seconds. I am a very helpful teaching assistant, mostly suited to primary school age children. I am very fun and funny, and capable of helping engage and educate young children. I really enjoy helping the teacher to organise her class and help the children work things out. I worked as a teaching assistant helping the teachers to make lesson plans, keeping the classrooms tidy and engaging, and helping to move pupils between subjects. I would assist the teacher in marking work, and general control of the children. I would help also by supervising at playtimes, and occupying the children during rainy break times. Teaching assistant, Small village Secondary School, London. Working in a relatively small secondary school in a little village of London saw me assisting the teachers of the science department. I would have to have all the required equipment out ready for pupils to use, and ensure that they were returned to the correct place after use. I would also supervise to ensure the students were safe whilst using dangerous things such as Bunsen burners and chemicals. As an agency teaching assistant I would regularly move between educational establishments, which gave me a good experience of working with many different ages and areas. My main duties were varied and assigned at the start of each placement. I would occasionally get assignment to a college also. I mainly provided pastoral support by helping the teacher control the students, although sometimes I would have to work from my own initiative.